The story goes that Kate Kenyon, known locally as Betty Kenny, her charcoal burner husband Luke and their eight children lived under a huge yew tree, reputed to be 2000 years old. The tree stood in Shining Cliff Wood near Whatstandwell. 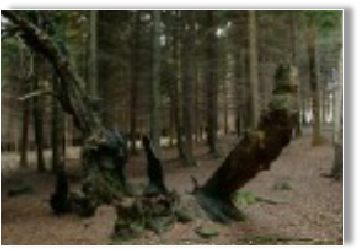 A hollowed out bough served as a cradle, and local legend suggests that this is the origin of the nursery rhyme ‘Rock-a-Bye-Baby’. The yew tree still exists, but was severely damaged by vandals in the 1930s. 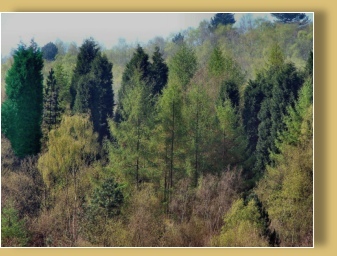 My photograph of Shining Cliff wood is printed onto silk and the foreground trees enhanced with stitching. 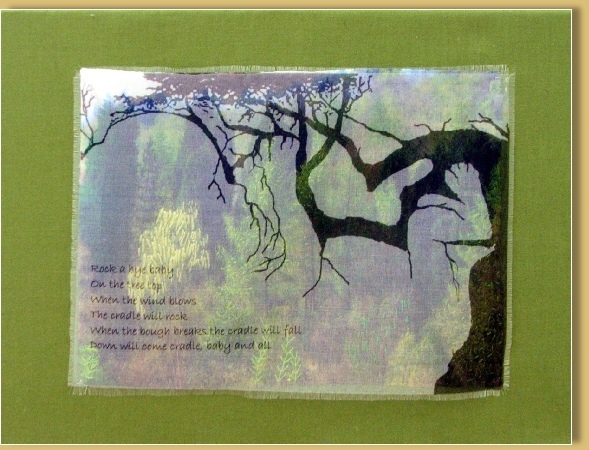 This is mounted behind ink jet printed organza. my printer takes a lot of punishment - don’t try this at home!